Today, I’d like to introduce you to a new blog we have created at Imagine! : the Imagine! Voices blog. I have frequently said that social media is creating new opportunities for individuals with developmental disabilities to engage in their communities. Social media is all about community. There are groups out there using social media for every interest, hobby, or pastime you can think of, and a lot more you probably never thought of. And technology has made accessing those communities relatively easy, even for those with significant disabilities. Since Imagine! has a stated mission of providing community access and opportunities for people with disabilities, it seems natural that we would want to use these tools to benefit those we serve. This is where Imagine! Voices comes in. Imagine! 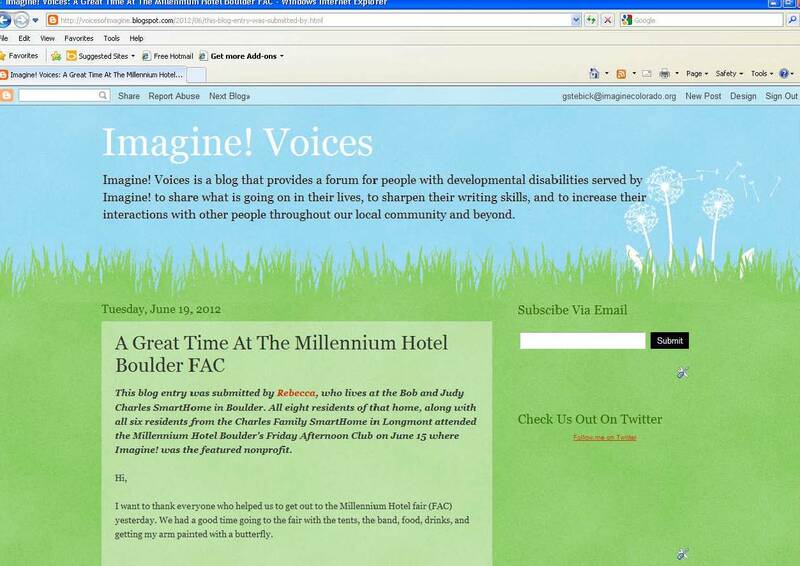 Voices is a blog that provides a forum for people with developmental disabilities served by Imagine! to share what is going on in their lives, to sharpen their writing skills, and to increase their interactions with other people throughout our local community and beyond. So, what kind of posts have been made on the Imagine! Voices blog so far? Well, how about the one from Bob, where he shows off his brand new Tim Tebow jersey? Or the one where Chris talks about how much he has learned about technology since he moved in to Imagine!’s Bob and Judy Charles SmartHome? Or David talking about his bowling leagues? Or Jessica sharing information about her trip to New York? There are many more posts like the ones I just mentioned. This blog is proving to be a fantastic opportunity for people served by Imagine! to share their own stories using their own words. I also think it is a great example of how technology can be harnessed to provide opportunities to educate the public about the many contributions people with developmental disabilities are bringing to their communities every day. Would you like to follow the blog? You can sign up to get new posts delivered to your email inbox – just look in the top right hand corner. You may be surprised at how much you learn about what people served by Imagine! are achieving every day. I've been following the Imagine! Voices blog for a few weeks now. I find it fun, informative, and inspirational. I love hearing what the people served by Imagine! are up to. I hope everyone will follow the blog and also comment back. Bloggers love feedback.